Hi again my friends. I will try to make this post a little shorter, but sometimes when my fingers start talking, it is hard to shut them up. What with all the news lately about Scientology, the subject of disconnection has been coming up a lot. I found that there were a few things that I wanted to say about it in my own way. If you listen to the spokespersons of the church, they will tell you flat out that there is no such policy as disconnection. They will tell you that when disconnection does occur, it is a personal choice and no one is forced, ever to disconnect. All of Scientology's public spokespersons are trained and drilled to be able to look you, or the camera, right in the eye and lie with the look of an angel. Actually, just about any staff member can do the same thing. One of the things you learn to do in the Scientology Training Routines. Probably any member of the church would give you the same spiel. They don't know any better. This is what they have been told. They also don't have any idea, for the most part, what is going on out in the real world. They are not encouraged to watch television or read the news papers. Most of them, at least to their knowledge, are not lying. They get their data from a course that most Scientologists end up taking. It is called the PTS/SP Course. (This means Potential Trouble Source/Suppressive Person). I will explain as we go on. The pertinent excerpt is this. Hubbard wrote and Scientologists believe that If you are ill, injured or in an accident you are either connected to someone or something that is antagonistic to Scientology, or, you have done something to Scientology. Either way, you are PTS and need to be fixed. in order to obtain results in handling the person connected to suppressives. and only from a PTS condition. A. Discover who or what you are PTS to. Then B. Handle or disconnect. Handle means, make the person see that Scientology isn't bad, or at least get them to lay off, or, you need to disconnect from that person, of your own volition, for your own good. So they don't see it as lying when they tell you it is a personal choice. But what they don't tell you is that if a person publicly leaves Scientology, publicly tells Scientology's secrets, publicly disagree with Scientology policy or say something bad about Hubbard or David Miscavige in person, the church is probably going to declare you a Suppressive Person. (This means that you have been excommunicated from the church). These days, Most active members of Scientology don't know who is declared or who has left, and if they are told anything, it is something like this person was kicked out for practicing Scientology in a non-standard way (what they call a squirrel). Or that you have committed some other kind of high crime against Scientology. A lot of people have been coming forward recently with horror stories about not being able to see or even speak to their friends and loved one's. The church, through it's spokespersons tell you it is all lies. Fine. I will show you something and let you make up your own mind about that. I have redacted the persons name for their privacy. You see where it says this person's "only Scientology terminal is the International Justice Chief via the Continental Justice Chief"? In Scientology, a terminal is someone that you may communicate with. 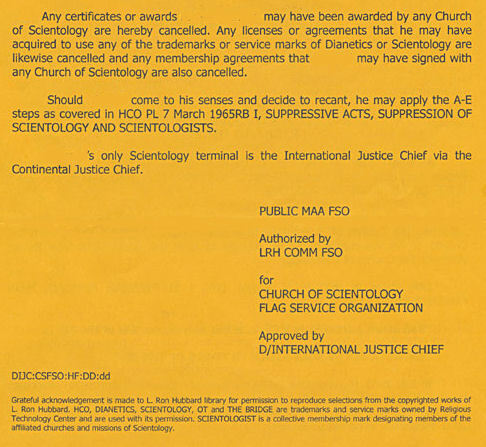 This makes it clear that if you have family or friends that are members in good standing of the Church of Scientology and you have been declared, that you are NOT permitted any contact with them. And if you wish to have relations with your friends and family, your only choice is to tuck your tail between your legs, go back and say you are sorry. That you are a horrible person and beg them to take you back. Of course then you will have to jump through several hoops called steps A-E. I will explain. HCO PL 23 December 1965, ETHICS SUPPRESSIVE ACTS SUPPRESSION OF SCIENTOLOGY AND SCIENTOLOGISTS THE FAIR GAME LAW. If you have been on Staff or in the Sea Org and have left without permission, or publicly left, you are not only declared, but you owe them for any training and auditing you have ever had. This alone could amount to multiple thousands of dollars. Depending on you training and counseling level at the time you were declared, this could add up to hundreds of thousands of dollars. You will probably be expected to make another very large donation to the International Association of Scientologists too. You get the idea. They are going to make it damn difficult for you to get back in. You will have to prove that you are worthy. So if you ever meet someone who says that they have been declared by the Church of Scientology, give them a big hug and tell them that you will be their family until they can be with their own. Thank you my friends for sticking with me. Please pass this along to anyone you think needs to see it. And as always, I welcome your comments. Excellent work, as usual, Robert!